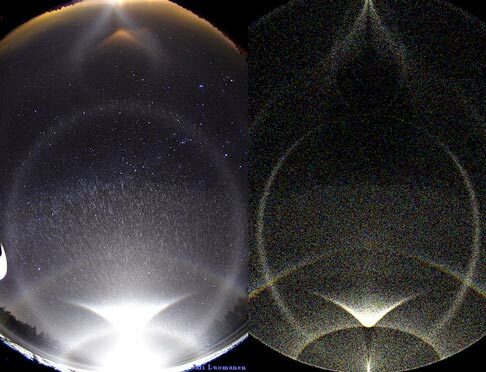 Halo displays created with a bright lamp seem to commonly exhibit a distinct intensity treshold at the zenith. This treshold is especially prominent in the photo above, taken on 13 December 2007 in Pälkäne, Finland as well as in Jukka Ruoskanen's images from Hyvinkää during the same night ( 1 ). The effect is also seen in the photos from Rovaniemi in early November 2007 ( 2 ). In all these displays the crystal swarm originated from the snow guns of a nearby ski resort. The intensity threshold cannot be adequately simulated using regular hexagonal crystals. However, when semi-triangular singly oriented columns ( 3 ) are used, the intensity threshold appears, as shown in the simulation above. 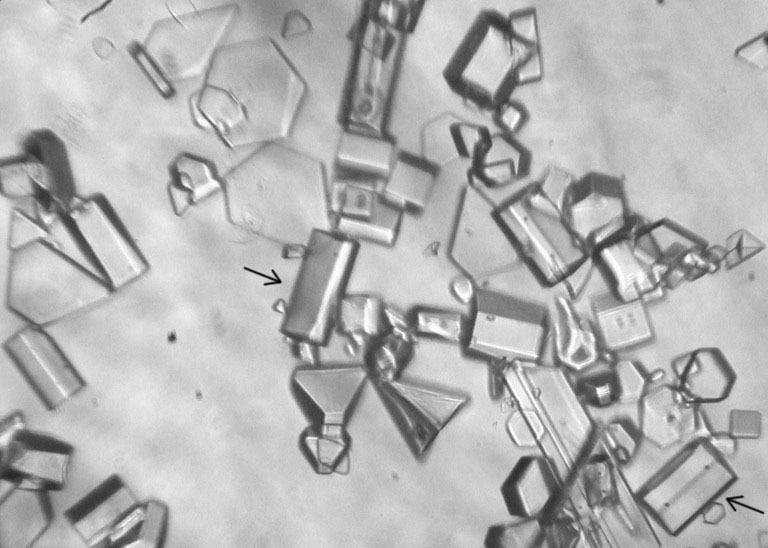 Such crystals are common in snow gun displays, as is evident for example in the crystal samples of the Rovaniemi display ( 4 ). Two arrows point to almost completely triangular columns. The simulation as well as the crystal image are made with software developed by Jukka Ruoskanen. 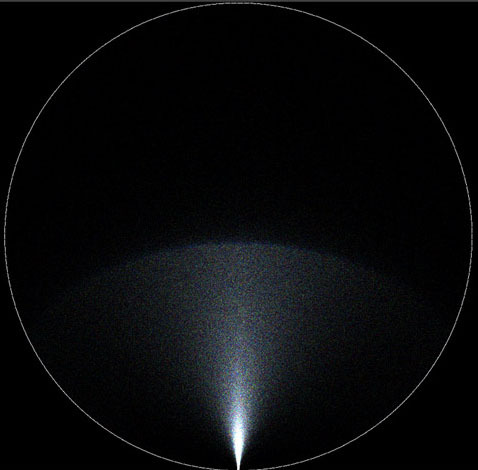 In the simulation also random crystals were used to create the 22° halo. The raypath for the intensity threshold is 3-5-7, which, in fact, makes it a sun pillar. A filtered simulation reveals how this sun pillar forms a huge fan shaped effect with sharp outer boundary ( 5 ). This simulation was done with a program by Mika Sillanpää and Jarmo Moilanen.